Here are a few pictures of the Sanctuary. The Sanctuary occupies 5.3 acres which includes a pond of approximately 1 acre. The site is illuminated in the evening and has surveillance cameras throughout to assist in the.. Please visit my friend @ Doug’s website. 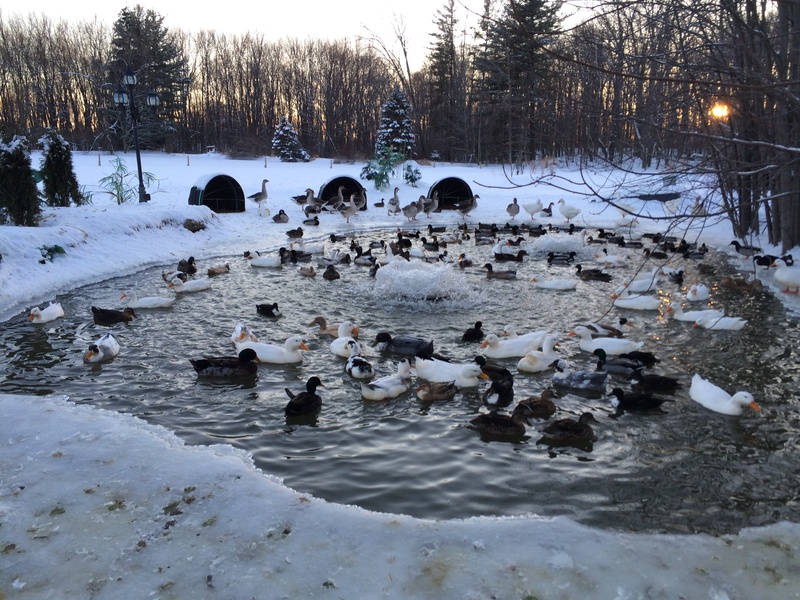 He has a very nicely written blog (with great pictures and video) relating to the ducks and geese that live year round at Mill Pond in Brighton, MI. Doug has been very instrumental in the development of this website and we are sincerely grateful for his continued assistance. I wanted to contact the sanctuary because I had recently bought 2 ducks from tractor supply during chick days and I starting thinking as they grew bigger that I couldn’t supply them the life they needed or that they should have. Seeing the sanctuary I was going to contact you to see if you would take them, so they can get the care and space that they deserve. Unfortunately, I am beyond capacity because of similar purchases such as yours. 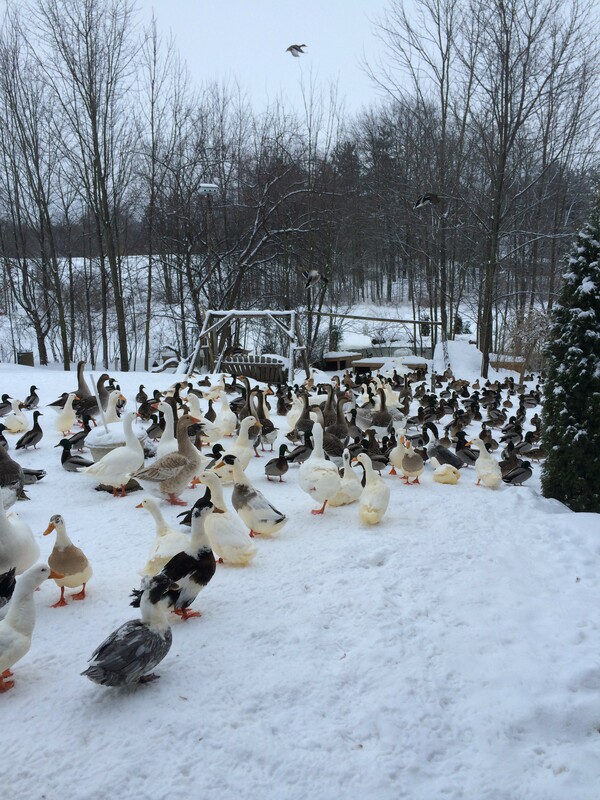 If you could please text me some pictures of your ducks to 248-446-2021, I will try to help place them in a nice home. Thanks, Matt. I am looking for a couple female Muscovy ducks..I heard you have some.please text back..I live in the country with a big pound and 20 pet ducks. My brother recently brought home two ducks from Tractor supply for us and had us beliving they were fine and they not. He leaves for work all day and they sit in a bucket freezing not eating or drinking. Please email me if you could take them in. My oldest sister bought 2 Ruin ducks and and can no longer take care of them. My mother and I have been trying to call local animal rescue places to try and find a home for the ducks but it seems that no one wants to take the 2 ducks in. And we live in Silverdale Washington, so I was wondering if you could give us some advice on what to do or if you have someone we can call for the ducks? Hi Jennavive, did you find a solution for your two ducks yet? I have space for your ducks . do you still have space for ducks? I have one duck that needs a home. I am extremely ill and need to find him a home quick. Please help. Do you ever place ducks up for adoption? Or relocate them to individuals that can care for the ducks and are willing to take them in? We bought 4 Pekin Ducks from Tractor Supply about 9 weeks ago, as much as we love them , I feel like they need to be near a pond and free to roam around . Right now we have them in a fenced in area to keep predators out with a baby pool to play in . The water is changed about 3 times a day but I still feel like their quality of life is not what it should be. Are you taking Ducks at this time or know of a place that is ? Can you suggest a vet experienced with Peking duck. In September I rescued 2 ducks that had trouble walking and were being attacked by geese. Love them dearly. I have been giving them niacin and one of the ducks is almost back to normal. The other one not as good. She has a great safe environment but just can’t get around much. HI Sally, can you please call me at 248-446-2021 at your earliest convenience. Thanks, Matt 248-446-2021 Sorry for the late response, internet was down due to the wind damage. Hi my husband works near the Ambassador bridge, there are a few geese, one of which is limping & it seems the others are starting to pick on the injured one. We have no idea or means of capturing it w/o causing further injury & we are seeking advice on who to call for to get it help. It limps & seems to be loosing weight. Hi, so the people that live down the road from me had about 15 ducks/geese (not sure what they are) last year and from what I’m told something got all the ducks except one during the night. Now the only survivor comes down to my house at night. He isn’t really a bother but we live in a neiborhood he has almost got hit by cars my neighbors right next door have rottweiles who I have had to stop from eating the duck. The people who actually own the duck told me I could keep it or shoot it they don’t care so now I’m am trying to find out what I can do with this guy. Was trying to find someplace closer to me that might take him but not find much was wondering if you had any suggestions. I’m in Clare county. Did you find a solution yet? If not, still feel free to call me. Still have no idea what to do with him. Tried talking to the owners son again but he says we should just shoot it and that they just got 3 baby ducks so they don’t care what happens to this duck. So at this point I bought a small pen so I can hopefully keep the duck safe from the neighbors dogs till I find him a home. Can you text me some picts? I will take him if you’d like to bring him by. I don’t know who around Claire might take him. Text them to the phone number in the previous text. Do you still have the duck? Hi there! I just happened upon this website. Just wondering if you ever put ducks up for adoption? I am interested in a couple of Pekins. I have one already and she needs some companions. (The chickens aren’t interested in being friends!) i would love to have a couple more. Never in a million years would I thought I would be searching for a Duck Rescue, my mother has two beautiful ducks who she loves and they are truly like any dog or cat, they are trained so well, even potty trained. When I speak to her on the phone I have to speak to her ducks too. They always start quacking loud when she is on the phone trying to get her attention just like a child. She use to walk them when they were babies, but now they are older and she has become ill, they just stay with her in her home, close to her. She even has a pit bull and the dog even sleeps with them. They are her companion, it’s the oddest thing ever, she had a chicken and rooster, the same, the rooster died though, :(. He was a bit of a brat always cockadool do, just hearing my mother on the phone arguing with them like she is talking to a human was just crazy and her house where they hung out was cleaner then the rest of the house. Anyway, she is really concerned for her ducks. If anyone has any idea’s on what we should do please respond. Can you please call me at 248-446-2021. Thanks, Matt. Hi, I bought four ducks back in April and two of them are injured. The one was like that when we got him. Its like his joints on his legs go outward making his legs to go in. And he trips over his feet. He was doing okay with managing to walk up until now. He gets stuck where he is at and i have to go out and help him move and make sure he gets food and water. I also noticed from him trying to move that he has sores on his feet from repeatedly scraping them on the ground trying to get up (he curls his feet). The other one was fine when we got him at first. I think one of the other ducks stepped on him wrong when they were still ducklings. He limps on his left leg, it looks like it was sprained or twisted. He will also lay there and just shake his head back and forth. I know you have said in previous comments that you are full but is there anyone else that would be able to help and take just the two in? I am a resident of Nevada, who struggled for months trying to save the life of a very sick duck. The duck was completely paralyzed and with the help of Matt’s knowledge compassion and dedication to saving animal lives, I was guided by numerous texts, phone conversations, and immediate response to helping the animal I struggled to care for. He was much more knowledgeable than the vets I took the duck to, he assisted me more than anyone else, and he gave me advice that no one else cared enough to even respond to. I called numerous duck sanctuaries around the country to get advice and Matt and the Michigan Duck Rescue and Sanctuary was the only place that would pick up the phone. Every time I texted him, which was numerous he immediately responded. Without one ounce of funding or financial gain from me to the organization which he runs, I was given every bit of knowledge to care for this animal which is now alive and well. After 8 weeks of of care and constant correspondence, this one duck’s life was saved. If he cares that much for one duck, that isn’t even on his site, imagine how he cares for the ones that are! Matt you save lives and we are so grateful to you! Have no doubt, this is the sanctuary that deserves your attention and hopefully financial assistance. 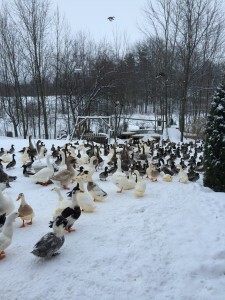 Hi, we would like to rescue a few ducks for our homestead. 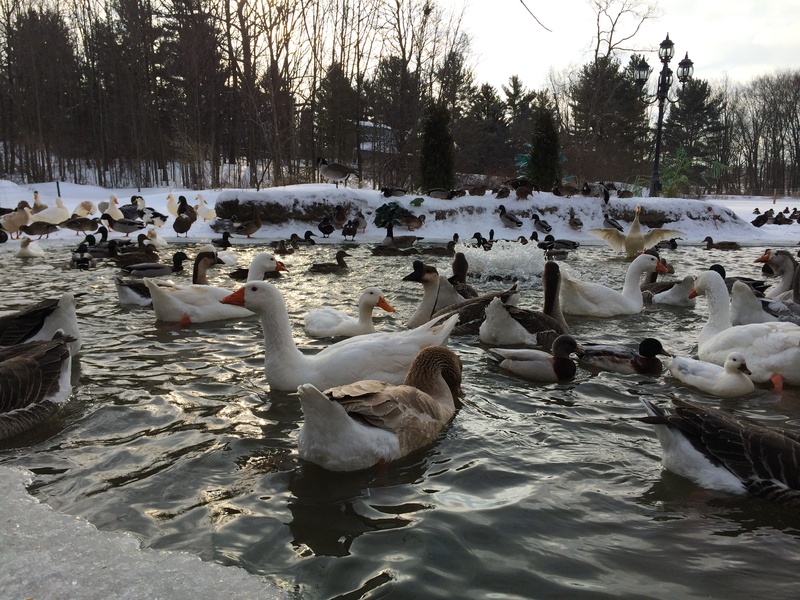 We have wild mallards & wood ducks that visit daily & we LOVE them. We have a creek & pond on our property. Is this something your sanctuary does? My daughter has been wanting to get ducks for years. We finally live somewhere we can have them. She has put in a lot of time & research to ensure we are ready. We are working on building a proper habitat. I found this site last year & we have been following you ever since! was wondering if we could adopt from you? Hi. We were the recipients of ducks that were dumped at a local animal control. They came to us through a rescue I volunteer with. They’re doing great! We got them in November so our learning came through the winter. We’re ready to enjoy them now during the easier summer cycle. 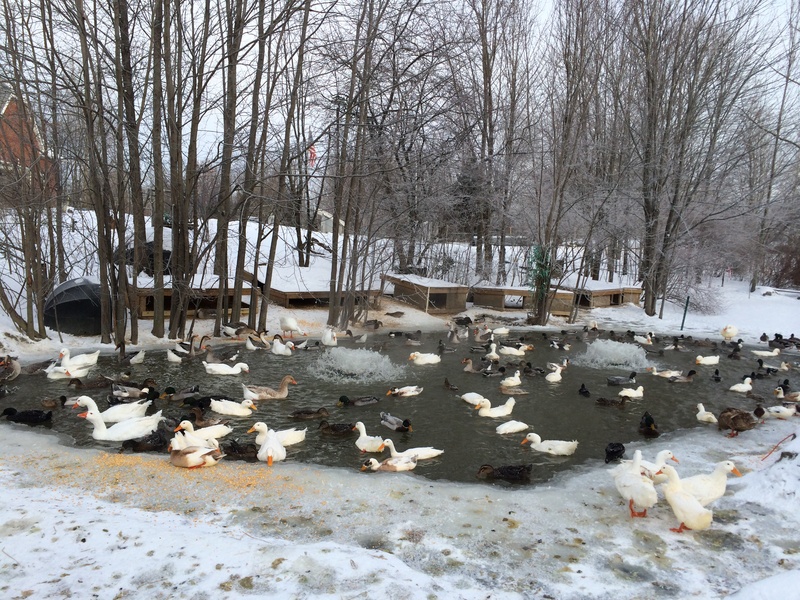 We have a very large pond on our property and have room to add a few more. Do you ever adopt out? We’d be open to a home visit if you wanted to see what we’re doing, and the modifications we plan on making. We don’t want to purchase babies but would rather keep with our family’s goal of rescue. We have a family FB page Second Chance Homestead where you can check us out. Please contact me if you have some ducks that need a new home. We have Pekins, Mallards (and other brown ducks I haven’t specifically identified) and Indian Runners. Hi Matthew, I am looking to adopt some Welsh Harlequin ducklings. Do you ever have ducklings? I would prefer to rescue vs purchase, but would like Welshie’s because of their temperament. We live in West Michigan with a about an acre and a half of land with a pond, and already have a shelter for them. I’m looking to get 3 females and one male to keep the ratio manageable. Thanks for your consideration. Hi Matthew, Our beloved 92 year old WWII veteran neighbor was an animal whisperer. All animals responded to him. Among many other animals he started raising peacocks a few years ago. He had them trained to eat out of his hand. He penned up the females when they were nesting to protect them from predators. Sadly he died approx. two years ago and he left his home to his 3 sons. They now rent it out. It has recently come to our attention that no one is caring for them. We were told they are “free ranging”. They need someone to take care of them. Can you help? Thank you. We have two domestic ducks in our pond and they are tamed. They do not know how to fly and could really use shelter or another environment to live in. My daughter has been obsessed with ducks since she could walk. She’s ready to run away from home (Northville) and live some place that she can have ducks, LOL. I suggested she maybe volunteer at a place with ducks instead. She’s 13. Do you need volunteers? Can you help me keep her home (kidding of course)? We have recently taken in an albino mallard duckling and need to adopt a friend for him. Please let me know if we may be able to adopt from you. I am worried that he is becoming lonely even though my daughter spends a lot of time with him. He is doing very well. Thanks for checking on him. I was wondering if you could give me some advice on my sick ducks. I took one duck to parkway vet last week and veterinarian didn’t have a solution to the issues, but thought it was bird flu. I had the test done for the flu and it was negative. The medicine helped with the puffy cheeks but the infection in the eyes is not better. All the ducks are on medication but out of 12 ducks 4 have an eye infection. I’m not sure what to do.